When I first picked up a copy of the Texas Observer I was an undergraduate at UT-Austin, working in the periodicals section of the LBJ Library. Back in the early 2000s, students still mostly did their research the old-fashioned way, by turning pages in books and magazines and journals. One of my jobs was to get the magazines onto the shelves for my peers. It was dull work, except for the chance to explore a wild assortment of publications. There was the splinter communist paper that favored enormous fonts and screaming headlines about U.S. imperialism in North Korea. There were weird, obscurantist, post-structuralist academic journals that used 30 words when three would’ve sufficed. I cut my teeth, or more appropriately paper-cut my fingers, on Harper’s, the New Yorker, Dissent, the Nation and many others. But it was the discovery of the Texas Observer that was most meaningful in my life. Back then the Observer was a biweekly printed on featherweight newsprint, with all the aesthetic charm of a receipt. Reading an issue left ink on your hands and the sobering feeling of getting the unadulterated truth about Texas, this mad, frustrating, wonderful place. In 2002, Nate Blakeslee — no doubt in the familiar position of Observer editors hungry for copy to fill the magazine — kindly published a feature story I co-wrote about a charter school. The best thing I can say about the piece now is that it was the first step on what’s been a wild and rewarding journey. I started as an intern at the Observer three years later. Like some other alumni of this magazine, I stuck around long enough to land a reporting gig, first part-time and then full-time. I made $28,000 a year and considered myself rich. Over time, I became our first-ever web editor and then in 2015, in typical Observer fashion, I was made editor-in-chief during one of our periodic financial crises. Now, after 14 years with the magazine, I find myself at the end of the road and the top of the heap. By the time you read this, I’ll have mosied over to Texas Monthly. No, I’m not the new assistant BBQ editor; I’ll still be working in the news and politics space. It’s no exaggeration to say I’ve grown up in this place. Almost everything I know about journalism, and much about life, I’ve learned from the editors, writers, designers, readers, sources and cranks who make up the Observer family. The Observer has grown up too. For much of the life of this magazine, we lurched from crisis to crisis, always a single funding source from calamity, always reliant on the poverty of the staff to make ends meet. The work was high-quality, but we didn’t pay enough attention to making sure the stories got read or developing a bigger, more diverse audience. We’d grown inward-looking and taken ourselves out of the larger conversation. The internet was an afterthought. The longevity of this publication is due to hard and often thankless work, and a crazy belief that Texas can, and will, become a more just and equitable state. I’m confident that we are now in a better position than we’ve ever been. Our budget, thanks in great part to our excellent four-person business staff, is as big as it’s ever been (though it’s still modest). Our editorial staff of nine — with more hires on the not-too-distant horizon — is as talented a bunch as we’ve ever had. Looking back, I’m blown away by the quality of the work we’ve produced, day after day, in print and online. As I write this, on my last day, the staff is putting the final touches on the May/June issue, which is chock-full of brilliant, compassionate, difference-making journalism. Look, it hasn’t been easy. Working at the Observer can be a bit like pushing a boulder up a hill while being attacked by grackles. (And hoping that a copy editor will save you from mixed metaphors.) But nothing true and right comes easy. I’m tempted to say that this magazine is a miracle. 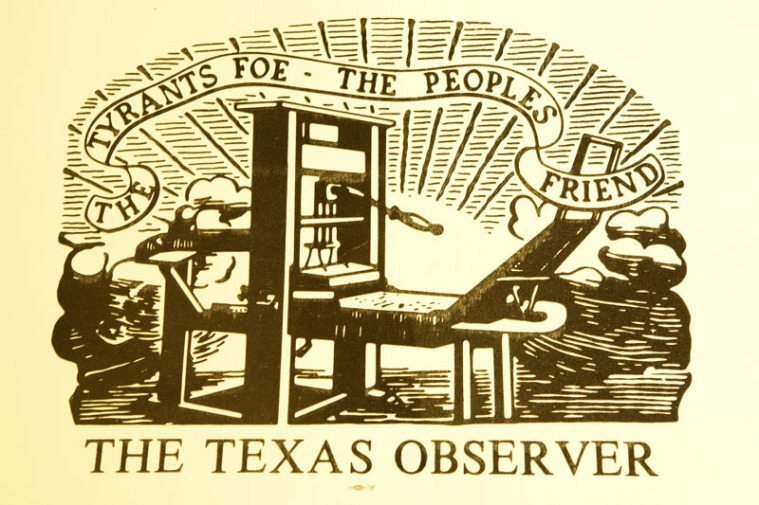 What’s more improbable than a left-leaning, independent, nonprofit publication in Texas that’s survived for 65 years and counting? But miracles are the stuff of saints and mystics. The longevity of this publication is due to hard and often thankless work, and a crazy belief that Texas can, and will, become a more just and equitable state. That world won’t emerge without truth-tellers working alongside the dreamers and activists. The Texas Observer is not just another media outlet. It’s a cause. I never thought I’d stay here for 14 years. And now a part of me can’t believe I’m leaving. Thanks, y’all.